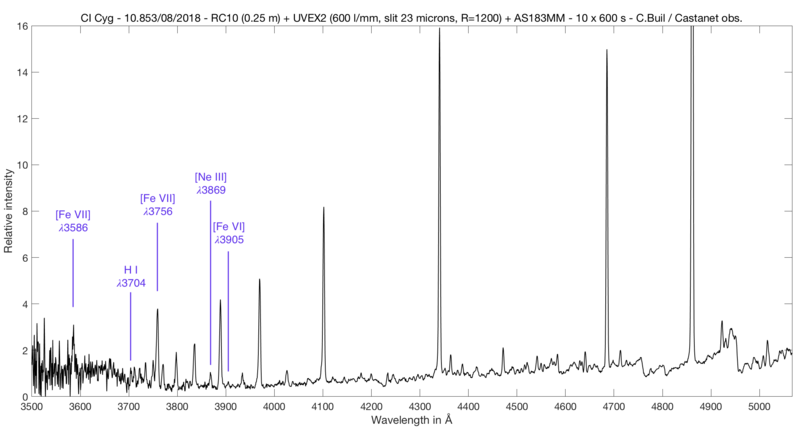 For lambda < 3680 A, the flat nebular continuum is well detected. Up to 3680 A we observe the red continuum from the cool giant. 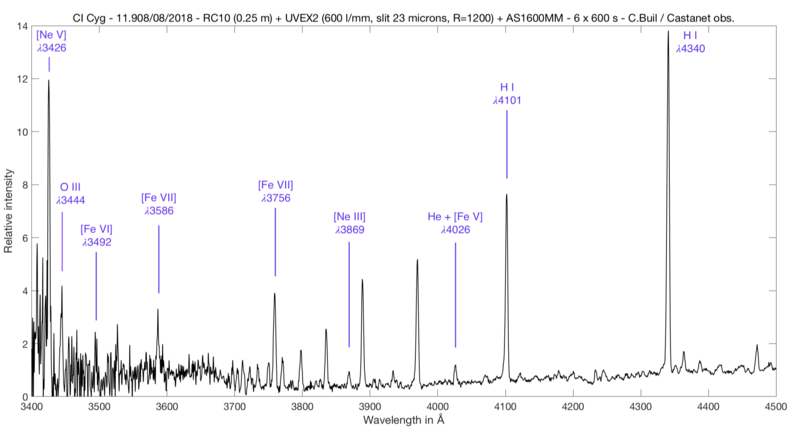 I confirm high-ionization forbidden line detection of the Fe VII at 3586 A (far UV for amateurs in fact !). Also the weak Fe VI at 3905. These lines seem associated to a colliding winds between hot component and the red giant. These lines are emitted by the outer atmosphere of the red giant, illuminated by the hot component. The corresponding electronic temperature is 10^5 K or larger. We explore here unknown spectral region for amateurs. Tu fais toujours de nouvelles découvertes sans arrêt !! Hier soir j'ai realisé un spectre Alpy600 C8 Atik 314L+ 12x300s resolution 560. Je ne sais pas la démarche est bonne, en tout les cas on distingue un finesse et profondeur des raies incroyables coté UVEX2 ! C'est une très bonne démarche Pierre ce type de comparaison. Mais on n'est pas vraiment dans le même catégorie d'instrument (Alpy600 couvre par exemple plus aisément la partie visible, mais avec une résolution inférieure- surtout que tu compare ici avec une version "boostée" de UVEX avec un réseau de 1200 t/mm). Mais clairement, en dessous de 3800-3900 nm, Alpy ne peut plus donner d'information valable. I believe the comparison is not fair. Note that I had a 10" Newton with an Orion G3 camera (8.6 micron pixel size) that time, and had wrong practice focusing the Alpy correctly especially in the blue. But, the continuum till 3670A have always been had the right curvature (of course Alpy degrarded resolution, and need careful processing to avoid filtration here). Also must take precautions at flat taking (I believe reflections are coming up below 3700A, and ref.star must also be at good quality in this region, and must be treated precisely). Some of such reducers already reported problems below 4200A earlier. - the 5 min exposure is low for no reason. For the Alpy (when the core element is firmed correctly), can maintain calibration for hours... (unlike LHires where 5 minute is reasonable) It is *ALLOWED* to let the H-alpha burn in, till you notify the database owner anyhow. I prefer zeroing H-alpha out (ISIS -> Edit tab) to really prevent its use. When weather allows, just go up to 20 minute when shooting faint object. However, reaching 3700A with the Alpy I saw working only with Newtons (see database). Congratulations for the UVEX2 ! Yes, I was also suggested by a professional to use Alt/Az for full spectrum use (and did start on yahoo such a discussion thread in the past already). When I mentioned my setup has short focal length (300/1200 Newton: only 1200), I was also told I can try to operate in the zenith. This is essentially what I'm doing for ARAS symbiotics since then, to make sure ref.star calibration works, and for simplicity. To operate at lower levels and get the ref.star calibration correct, maybe the wide slit is the right solution for EQ mounts, as already noted by others. When you optimize the guiding for throughput with the narrow slit, I suspect the guiding won't be fully reproducible by practice (guide optics not errorless - random reflections come up when star is getting off the slit). It was nice to get the UVEX2 to work at f/4 rather than f/8 RC, then the athmo. aberration also gets halved, and yet useable when operating in Zenith. Of course, non-balmer lines are speculative. Let me know if anything looks strange...1st batch of wide-band spectra I've processed.